Sunday mornings are above all made for long breakfasts in bed, with your computer on your feet while sipping a hot coffee. For me it's the time that I enjoy the most reading blogs or browsing through pinterest, love getting some inspiration while relaxing at the same time. I was really happy that you guys enjoyed the previous mood board that I made a couple of weeks ago, after all the inspiration that a blog can offer doesn't only have to be about daily outfits right? So my current mood is all about : industrial interior, braids, big shearling jackets and dreams about New York city. And what about you guys, do you share any of these or have any other favorites at the moment? Beautiful inspiration! Love oversized jackets too! love every single thing on these pics, so cozy and stylish! Great inspo, particularly love the interior photo! Love the moodboard, really inspiring. great inspiration, I like the moody grey colors everywhere, very wintery! 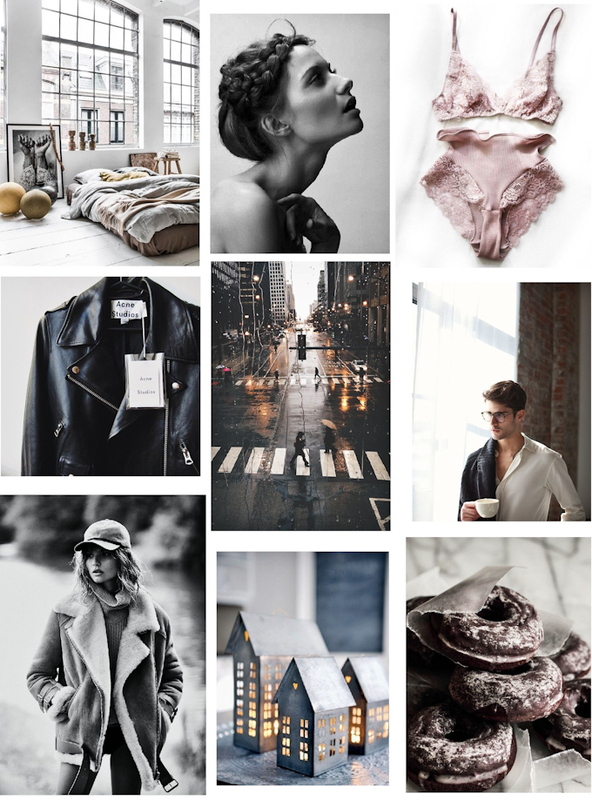 love making moodboards too, and this one is so nice!